Go Skateboarding Day was started on June 21st around 2003. By the International Association of Skateboard Companies (IASC). I believe Emerica shoes had something to do with it too. When ever I think of this day Emerica pop into my head. So they did a good job of branding it. It just makes sense to have the 1st day of summer be the day where you go skate. The official day to go skateboarding around the world. A sort of celebration for skateboarding. In many cities events are held in the streets where packs of hundreds of skaters move from spot to spot and session and have a great time all together. I always get out to skate on this day, even if only for a minute. Many local skateboard shops will do mini contests with free stuff and prizes on this day. Sometimes at a skatepark and often in the streets themselves. Emerica Shoes does Wild in the Streets with pros and all the fun stuff. they pick a city and roam around it with a huge band of skaters. Its awesome! 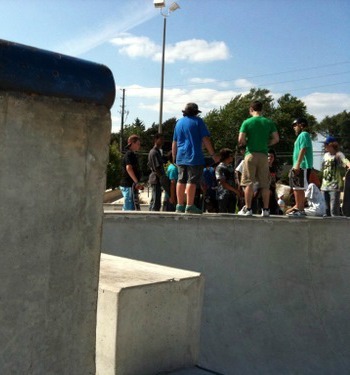 They set up a best trick contests, big games of SKATE. This gets the skaters hyped. Adding great energy to a normal day of skating. It reminds me that here are millions of skaters around the world out there having fun doing the same tricks I am doing. Such a positive day. It is really great to see the business side of skateboarding out supporting the skaters. The skaters get stoked to get free stuff and skate for prizes and the businesses get to have some fun too. Overall I really like when Go Skate Day comes around. It reminds me of how much I have enjoyed skateboarding and how much I look forward to skating even more.